Es gibt ein paar sehr coole Sachen, die in jüngerer Zeit für Cyberpunk als Genre rausgekommen sind. Da ist zum einen eine Vornheim-inspirierte Settinghilfe namens Augmented Reality. 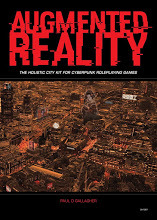 Awesome Setting Help for all kinds of Cyberpunk games. Rental Smart-Car Attendant: across the city, travellers rent their driver-less smart-cars by the hour or subscribe to commuter vehicles. For all their efforts, the corporations have yet to create the drone that can reliably pick the used condoms and burger wraps out of the lining between the car seat and the door. Wage slave – entry level jobs for your near future dystopia! Wage slave part 2: the restructuring! Wage slave 3: the redundancy!